One of the mysteries about black holes is that they only seem to come in two sizes: stellar mass black holes formed from the collapse of a star, and supermassive black holes at the centers of galaxies. The former are typically around 5 – 10 solar masses, while the latter can be millions or billions of solar masses. What we don’t see are black holes of a few hundred to several thousand solar masses, and we aren’t sure why. The search for intermediate mass black holes (IMBHs) has been going on for quite some time. We are pretty sure they exist, but proving it has been particularly difficult. Rather than being isolated and easy to observe, IMBHs tend to exist in the center of dense clusters of stars (so the theory goes). Since they are smaller than supermassive black holes, they don’t emit the same energy when they are active, so it is hard to verify that a dense star cluster has a black hole, and not just a very dense core of stars. But now a new paper in Nature has presented clear evidence for an intermediate mass black hole. The team looked at a galaxy known as M82 (also known as the cigar galaxy). 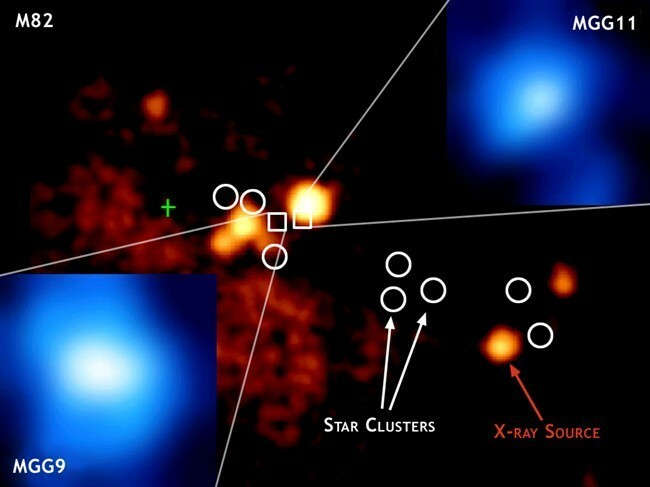 An x-ray source in this cluster has long been suspected to be an intermediate mass black hole, but the density of star clusters in the region has made past observations inconclusive. In this case, the team made careful observations of the x-ray brightness, looking for small variations. By analyzing six years of data, they found that the source fluctuates on a scale of 3 – 5 seconds. This is important because the rate of fluctuations can be used to determine the size of the source. Basically if an object is changing brightness, it can’t do that at a rate faster than the time it takes one side of the object to know what the other side is doing. That time is limited by the speed of light, so if you know the rate at which brightness varies, you know the maximum possible size of the object. 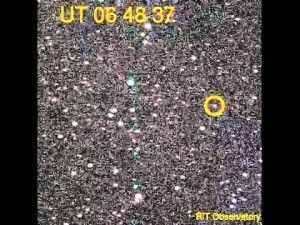 Given the 3 -5 second scale, this means the source must be a black hole of about 400 solar masses. It is therefore quite clearly an intermediate mass black hole. This technique can now be used to find other IMBHs. In fact the technique will be perfect for a new X-ray mission called the Neutron Star Interior Composition Explorer (NICER) which will be launched in 2016. If we’re about to have a NICER X-ray telescope, how long will it be until we have a VNXT (very nice X-ray telescope), an ENXT (extremely nice X-ray telescope), etc.? Do black hole get bigger as more stuff falls into them? I thought there were all kinds of different sizes of black holes and their size depended on the amount of stuff that had fallen into them. Yes, black holes can get bigger by consuming matter, as well as by black hole mergers. you write: ” Basically if an object is changing brightness, it can’t do that at a rate faster than the time it takes one side of the object to know what the other side is doing “. Is there somewhere I can read more about the idea you are summarizing. thanks.